Common seems intent on disproving the widely held notion that pursuing a career as a conscious rapper is tantamount to taking a vow of poverty. According to Forbes, the Chicago wordsmith recently made a whopping $12 million in a 12-month period. But Common traveled a long, adventurous road to riches. His 1992 debut Can I Borrow A Dollar? introduced the young MC as a clever lyricist with a sonorous voice and a gift for pop-culture punchlines. Common’s subsequent albums found him evolving dramatically as an artist through albums like Resurrection, One Day It’ll All Make Sense mature the Soulquarians-produced 2000 album Like Water For Chocolate, 2002’s wildly adventurous Electric Circus, a trippy psychedelic freakout that pushed the boundaries of major-label hip-hop sonically and lyrically and divided fans and critics. 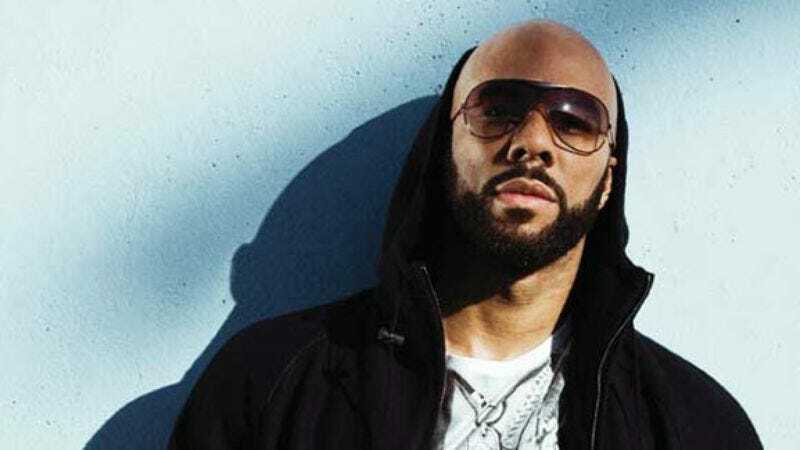 After Electric Circus, Common hooked up with fellow Chicagoan Kanye West, who produced almost all of his next two albums, 2005’s Be and last year’s Finding Forever and released them through his G.O.O.D. Music Imprint. G.O.O.D. also released Common’s latest album, Universal Mind Control,but the production duties are being handled by The Neptunes and Mr. DJ. Like many of his peers, Common has branched off into acting, turning in supporting performances in high-profile fare like American Gangster, Wanted, Smoking Aces and the forthcoming Terminator: Salvation. The A.V Club recently spoke with the Grammy award winner and Zune/Gap spokesman about Jeremiah Wright’s bum rap, homophobia, Barack Obama, trying to become a hip-hop Radiohead with Electric Circus and earning mad props from the money-grubbers over at Forbes. A.V. Club: Tell me about the new album. Common: It’s the future of hip-hop. It’s the sound that’s progressive. It’s produced by The Neptunes and Mr. DJ. And it’s music for you to enjoy, for you to get live to, for you to just dance to and move to, and just for you to ride to. It’s just good music that’s lighthearted that you can feel bright and better about. AVC: You’ve described it as a summertime album. Why release it in the winter? C: Well, what I meant by summertime, to be honest, was just [that] I associate summer with feeling good, feeling bright and sunny. And I think what this album is is definitely something that will make you feel good. That’s what the goal is. Man, I want you to move and enjoy yourself. You’re going to hear this song at a club. You will hear them songs at the beach or at the barbecues in the spring. And you will be able to ride to it and just feel good to it. So, that’s what I meant by “summer.” I feel like Universal Mind Control, the title,is a much more fitting name for this album, because when I hear that name, Universal Mind Control, it makes me think of the future. It makes me think of some movement that’s happening. I think this is a movement in music. AVC: So, it’s “universal mind control” in a positive way? C: Yeah, exactly. It’s definitely not talking about the Big Brother theory and all those things going on in the world. We know that they do control our minds, but this is universal mind control in a good way—basically saying, we want you to elevate, then we’ve got to get you to elevate through what we do in music. We may instruct you to do that by making the music to get you to do it. You understand what I’m saying? AVC: Do you feel like the election of Obama has ushered in a new idealism? A new sense of hope in our country? C: There’s definitely a new sense of hope with Obama being elected. I felt that the night at Grant Park when I was there—just the diversity in the crowd and the hope you could see in people’s faces. That’s where we are in this country and in this world, hopefully—that people are starting to feel better and have faith in the fact that God is going to take care of us and there’s going to be a better day. And my music, I was making it at a time when it felt darker, but I wanted people to feel that hope. Instead of saying, “Hey, man, we in troubled times,” I wanted to say, “Hey, it’s going to be better, y’all. Look, it’s a good day.” Speaking things into fruition in a way, you know? AVC: Speaking of Obama, you grew up in the Trinity United Church of Christ. Can you talk about Revered Wright? C: Since I was eight years old, I went to Trinity. I mean, I listened to Reverend Wright since I was a kid and I always heard him preach sermons of love and inspiration. And of course he would talk about the community and about the ills that were going on in the community. And if the government did something that we all at the same could see was not good for our community or for people, then he would speak up about it. But he never was an advocate of hate or putting out negative things about people. It was just more like, if the system was oppressing people, he would speak about it. His sermons were sermons of love and that’s why he was able to inspire a book for Obama. That’s why Obama went to Trinity, obviously—he was inspired himself that Reverend Wright was a man of love and a preacher of good word. AVC: Did you know Obama from Trinity? C: Not from Trinity, but I met him at one of the hip-hop summits that Russell Simmons had. AVC: Were you immediately impressed with him? AVC: In the 90s 2pac famously rapped, “Although it seems heaven sent / We ain’t ready to see a black President?” What do you think has changed between 1996 when Tupac said that and 2008? C: Well, I think one of the things that changed is—we went through a really rough time, you know. We’ve been through some hard times, not that times weren’t hard then. But once the Bush regime came in and this country went to war and the economy just started getting continuously worse and times became rougher, people went through so much. Whether black or white, they wanted somebody that was going to come in and do right by us and do right by the system and do right by the poor, the middle class, the rich. Black, white, yellow, brown—we wanted somebody who would do right by us. And I think because Obama was that person, whether he was black or white, he was chosen and I think the world was able to see that because of the rough times that we went through. It’s like at a certain point, say if you were a prejudiced person, and you’re drowning in the middle of the ocean and someone comes with a lifesaver—you don’t care if that person’s black or white. You don’t make that kind of distinction when someone’s coming to save your life or just making things better when you’re drowning. You know, when things became that drastic, color doesn’t matter that much. AVC: You were recently named by Forbes Magazine as one of the richest rappers of 2008. How did that feel? That had to be a strange experience. C: Yeah, it definitely was strange. I didn’t know I was one of the richest rappers in 2008. But it was definitely a strange feeling. You know, as a businessman, you continuously want to keep growing and keep expanding, so I didn’t know I was at that level as far as rankings or whatever. More than anything, I just want my business to continue to grow and to keep expanding and giving back to the community when I do grow and trying to provide jobs and opportunities for people who don’t have it right now. AVC: Did you feel kind of exposed? I would feel weird if people knew how much money I made. C: You definitely feel a little exposed, because some of your friends call you like, “Man, I need that much.” Whatever they take is, you’ve got to get calls about how much you’re making. So yeah, it was a little bit of exposure. AVC: You’re generally described as a conscious rapper, which has a double-edged connotation. How do you feel about that? How do you feel about being labeled as being conscious? C: Oh man, I love it because I’ve always associated consciousness with artists like Bob Marley or Joni Mitchell or Bob Dylan. You know, artists that really talked about what was going on in the world and really artists that are timeless. So, though I know consciousness kind of boxes you in, it still encompasses the artists that I knew were conscious throughout history of music—they’re the ones that you look at as the legends. AVC: That’s the rap on conscious artists—that they’re people you should listen to, but who would never sell many albums or make any money. Obviously, that’s not the case with you. C: It still is a quest to get people to become aware of the music that I’m doing. And some of my victories have come over different facets of entertainment, like when I’ve been able to do commercials with the Gap or commercials with Zune that expand me to a whole new audience. And also, doing films. These are the things that have helped expand me and [made] people become more aware of my music. AVC: As a practical matter, with the record industry being were it is, it’ll probably be hard to make a living just off of royalties alone. C: Put it this way: I would definitely be working at Denny’s or something. Well, maybe not Denny’s, but I’d be doing another job if I had to just live off royalties because I didn’t sell enough records. Shoot, honestly I’ve been able to make a consistent living off of performances and endorsement deals more than royalties. AVC: Do you worry sometimes that doing commercials for the Gap doesn’t jive with the consciousness of your music? C: No, I don’t really worry ‘cause every time I do a partnership with the corporation, it’s usually—I mean, it is—reflective of me and they really want who I am. They want what I’ve established for my brand and the respect and quality that I’ve established. So they allow me to do what I do, and just associate it with their product. And I’m not associating myself with products that are not of a certain caliber and, like I said, I get to creatively direct these things. You don’t see me jumping around, doing something that’s out of my character. It’s more like, Hey, they get a piece of Common. I get to use their platform to display who I am to the world. I specifically remember the Gap commercial when my mom’s friends called her and were like, “Man!” And I had released six albums up ‘til that date. They called her up after the Gap commercial and were like, “Man, we love this song.” That was the first time that they’d really paid attention to my songs or any work that I’ve done. So, it gives me a chance to reach new audiences by being me. AVC: Some of your early work contains derogatory references towards gay people. Can you talk a little bit about the process that led you to swear off doing that in your music? C: I think it just came with me evolving as a person and me understanding that it’s not right to judge or to say anything derogatory about other people, especially if I don’t know them. So, I had fans who were homosexuals come up to me after a performance and be like, “Man, my mother’s gay and when you said something about gay people it hurts me.” And when I heard that, it just kind of touched me and it made me think—I’m talking about people that I don’t know anything about. It’s not up to me to try to judge them. That’s between them and God. I decided it was better to embrace than to say ignorant things. AVC: In “I Used To Love Her,” you bemoaned the path hip-hop had taken, yet 1994—which is when it was released—is still considered the tail end of the golden age of hip-hop. Do you think hip-hop has evolved or devolved since then? C: It has definitely evolved in many ways. The ways that I think it’s evolved is artists now are doing different things and trying different things as far as ways to express hip-hop, like using different sounds. Some artists are definitely trying to do different styles. Some, not a lot. But even from what you’ve seen [of] Outkast, Kanye West, and Lil’ Wayne, and different people expressing their way of evolving in hip-hop. In the evolution of hip-hop, they’re doing different things. And you’ve seen hip-hop have more of a global presence and impact on the world, where it can help affect an election. I think it’s devolved in a way that you don’t find as many, on a whole, hip-hop artists that are being creative, that are finding their individual voice and doing something different. You don’t find as many artists that enjoy it and make music that is fun. So, that’s where I think it’s devolved. AVC: Speaking of the ways that hip-hop has changed overtime, currently the big craze is for Auto-Tune—Kanye’s new album is very heavy on it. What are your feelings about Auto-tune? Is it something that you could ever see yourself using? C: [Laughs.] No. I think whatever an artist does, it just has to be quality and good. I think the way Kanye’s doing what he’s doing with the Auto-Tune is actually creative because he just writes good melodies. He just writes good songs. He’s just gifted. Some people ask me, “Man, do you think everybody can do that?” You’ve got to be talented with certain things to do it. And what I’m saying is, Kanye is talented and gifted, so when he does these things with the Auto-Tune, it just sounds great to me. I like it. Even though other rappers may be doing it, I like the way Kanye is approaching it and I like his sound with it. I enjoy what he’s doing with it and I definitely feel that at times when Lil’ Wayne does it, it sounds fresh. And obviously T-Pain originated it and I know a lot of people are doing it, but it’s something that I feel like—it wouldn’t be me expressing my voice because I’ve always been noted for being original and doing different thing. So for me to hop on the train that’s going on would be—shoot, if I wanted to hop on the train, I might as well have hopped on gangsta rap back when it was popular and tried to do that. So, I’m definitely not going to hop on the train of Auto-Tune. AVC: Speaking of Kanye, he produced almost all of Be and Finding Forever. What led to you working with other producers on the new album? AVC: He’s part of Organized Noise, right? C: Well, no. He used to work more with Earth Tone3, which was Andre 3000, Big Boi, and Mr. DJ. They did “Bombs Over Baghdad” and they did “Ms. Jackson.” So when I heard his music, I was like, “Man, this is exactly the direction, the progressive sound that I’m looking for. That’s me. That’s what I want.” So it became that and that’s when I started just going with whatever I felt, with whatever felt right. I’m really an artist of feeling. I like creating things when it feels right, so it just felt right to go when I was working with The Neptunes and Mr. DJ and I knew Kanye had my back. He was going to check it out and let me know what he thought about the album. And when he was like, “Man, this is one of the most incredible albums you did,” I knew I’d made a good choice. AVC: You also worked with The Neptunes on Electric Circus, which again was a big departure, especially production-wise from any other albums. Can you talk a little about what was going on in your life that led you to take those chances? C: Well, at that time I really felt like, man, I really need to find something else to do in hip-hop, because I was becoming bored and felt like the same thing was going on. I really was trying to establish a new sound and a new voice in what I wanted to do. I was listening to Jimi Hendrix and Pink Floyd, because that was new music for me. I really hadn’t been up on them. I mean, I’d heard of them, but I wasn’t up on their music. And I kept listening to Radiohead, and I was like, Man, I want to make hip-hop that feels like Radiohead. I want to make hip-hop that can use guitars and soul and jazz and just fuse it all together. And I want to make this whole new sound that’s going to shock the world. Unfortunately, the masses didn’t receive it. A lot of the critics didn’t receive it with a lot of love. They didn’t hold it high, but I’m still proud that I did what I did and I wouldn’t change a thing about it, to be honest, because that’s all part of the growth and Electric Circus was just a reflection of where I was at the time. And now, I’m able to come and do a new sound and grow even more and make greater songs because my song-making abilities have grown. And I like challenging myself. I like the challenge of rapping to fast beats, rapping to beats that are super slow, whatever. I like the challenges, so I’m not afraid to take on any piece of music and create a song to it if it feels right to me. AVC: Because Electric Circus was such a departure, was it hard getting your record label to respond to it? C: They definitely didn’t… They was not trying to hear it. One of the presidents at the time said, “Man, it’s like you’re a restaurant and people came one day and ate soul food, and then the next day it’s like you’re cooking Japanese food.” He was saying I went so different that people wouldn’t be able to get with it. Obviously, that’s what they were feeling. They weren’t at all convinced that people were going to be able to get with it. But, hey… I just had some of the same journalists that panned Electric Circus at the time, they just listened to Universal Mind Control and they loved it. And then they went back to tell me that Electric Circus, if it came out at today, it would’ve had a different reception. One of them told me, “Hey, man. You need to bring it out again.” And I said, “Hey, it’s cool. It is what it is.” You make art for… You create it and people can respond to it if they like it. If they don’t, then they can go to the next artist or your next album or one of your previous albums. That’s what art is all about.